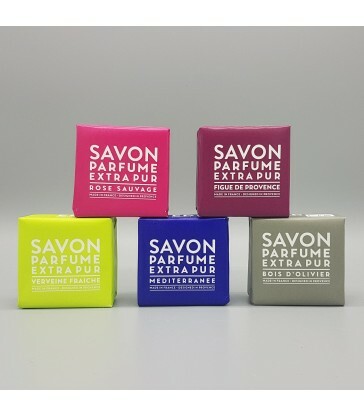 A square bar of soap in pretty and colourful packaging. Great little gifts for him or her. The soap bars come in 5 different scents. Fig, rose, olive wood, verveine fraiche, mediterranee Made with traditional Marseille soap and vegetable oils from France. 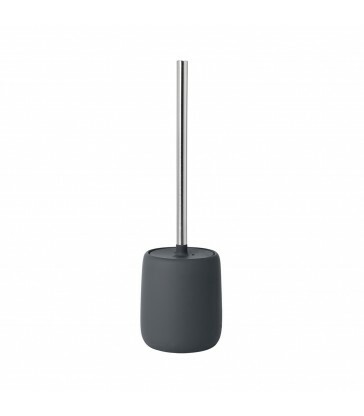 Bring the scent of the fresh Mediterranean sea into your bathroom with this liquid soap pump. 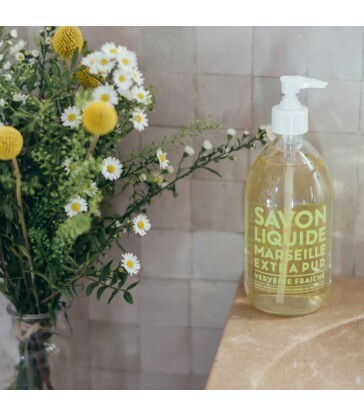 Made in the south of France using traditional soap making skills and using locally sourced ingredients The soap pumps come in 300ml plastic, 500ml glass sizes with a handy 1Litre refill bottle. 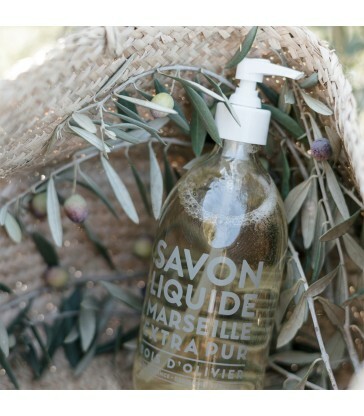 Olive Wood liquid soap in handy to use pump bottles. 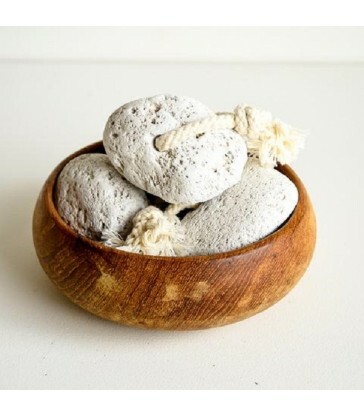 These French made soaps are produced using traditional soap making methods, using 95% natural ingredients. The bottles come in 300ml and 500ml sizes and you can buy a 1L refill bottle so that you can reuse your soap bottle time and again. The 500ml bottle is made from glass. CURRENTLY OUT OF STOCK Fresh lemony verbena scented liquid soap. These soap pump bottles, available in 300 and 500ml sizes can be refilled using the handy 1L refill bottles. The 300ml bottle in made from plastic, perfect for bathrooms where little hands might knock it over, whereas the 500ml is a glass bottle, definitely for the guest bedroom! A fig scented liquid soap pump. 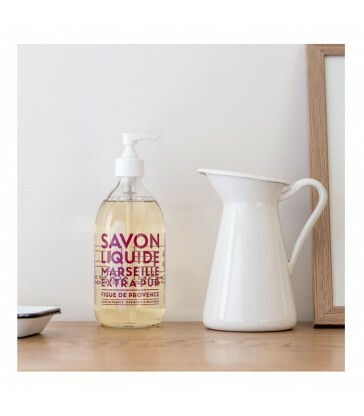 This French made liquid soap comes in 300ml, 500ml and a 1Litre refill bottle. The 500ml bottle is made from glass. The liquid soap is made using traditional soap making methods in a cauldron using ingredients sourced locally. 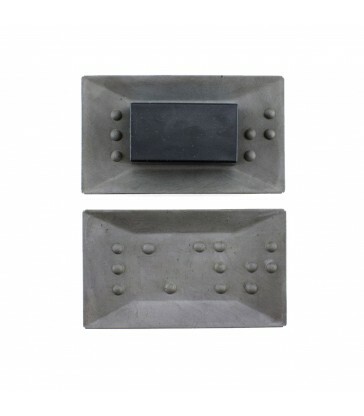 Dark grey concrete soap dish. Rectangular in size, it has a braille design on its surface. A beautiful wild rose scented hand and body cream duo. 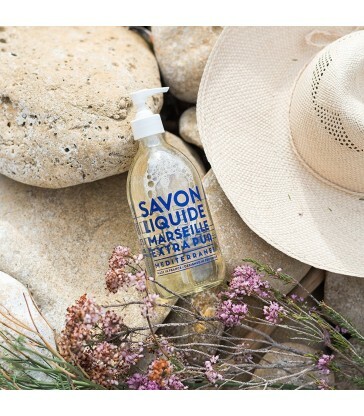 Made with nearly 100% natural ingredients sourced locally in France. The hand cream is 30ml and the body cream is 100ml so both will fit perfectly into your hand luggage when travelling. 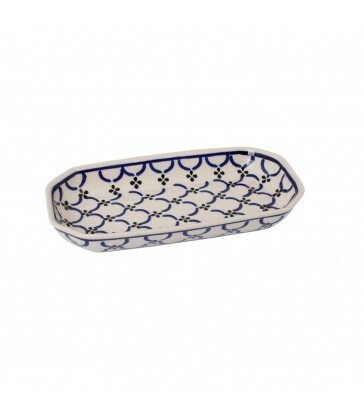 The perfect gift to care for dry hands and skin.